Max Bupa, a health insurance company, is doing decently well on social media but has a great scope of improvement to adhere to. Usually, the insurance sector has a bad reputation of not being active in terms of content creation and interaction. 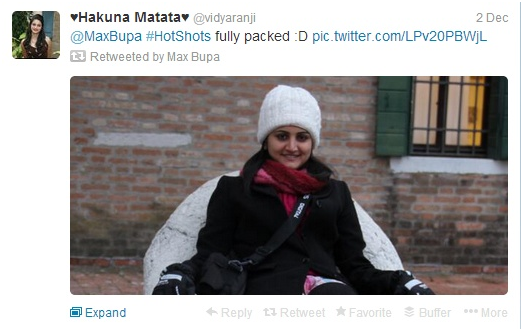 Though Max Bupa is active, it has a rather haphazard approach on social media. The overall strategy of the brand is to build awareness for its offline events. The brand has also indulged in building awareness of its products through indirect marketing on Facebook and Twitter, but in vain. 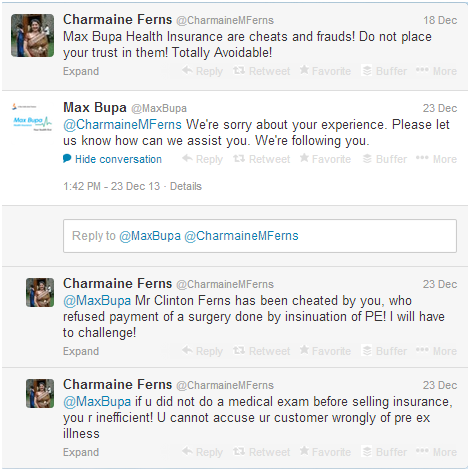 Max Bupa does not portray one particularly clear strategy on these platforms. I have analyzed the brand between October 2013 and December 2013. 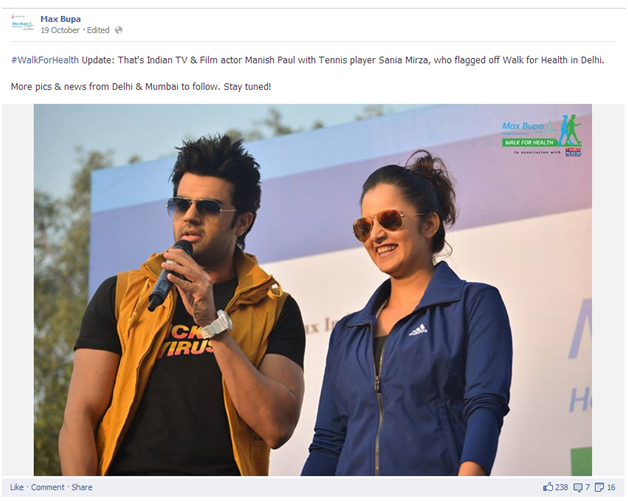 Max Bupa has a fan count of 168K on Facebook but only 9K+ people are talking about the brand. The PTAT score is only 5.6% of the total fans, which means that very less people are talking about the brand on Facebook. The fan following is growing by 7.54% which is also known as the likes growth. In terms of engagement, the brand has a restless graph. Between 14th October and 20th October, it had the maximum engagement while on other days, the engagement varied highly. However, it should be noted that even when it scored the highest engagement score of 444 in mid October, this is not a number to be very proud of. Since the brand has over 168K fans, its per post engagement is very low. Likes, comments and shares per post are important metrics while calculating the ROI of Facebook activities, since these factors define the success of an update. The more the shares, more is the organic growth. On an average, Max Bupa receives 134 likes, comments and shares per post. 95.8% of the post types are photos which have received the maximum interaction. As mentioned above, the brand engaged most with photo posts. A total of 306 photo updates were posted, along with only 6 video updates and 105 text updates. It also posted 8 links. 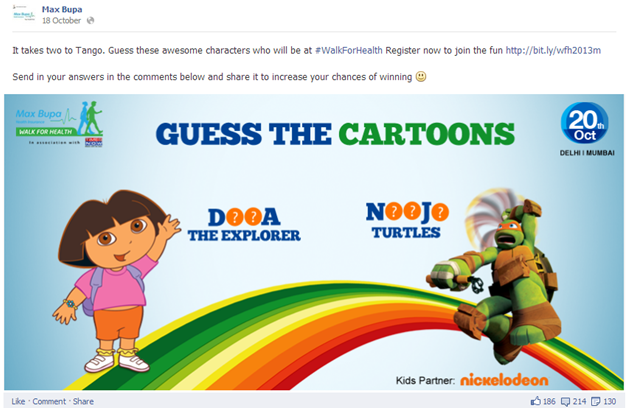 Another example of activities generating engagement on Max Bupa’s Facebook page is on 18th October 2013. The brand was executing a campaign ‘Walk for Health’ during the month of October when it posted an update seeking the participation of fans. On 18th October 2013, this update received immense engagement in comparison to daily posts. The brand posts on a daily basis, 1-2 posts per day on an average. 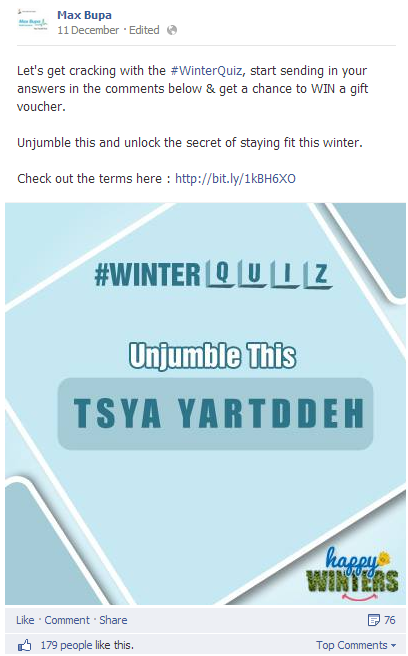 Lately, the brand has become regular with content posting, considering it skipped posting between 15th November and 29th November, post which it started the Winter campaign. While some posts on the page are relevant to the brand, some are absolutely irrelevant. Since, health insurance awareness should be the main objective of the brand, it can hardly be seen through the content posted. The brand does not hard sell for sure, which is a good thing. The brand is making an effort to connect with its fans through topical content. 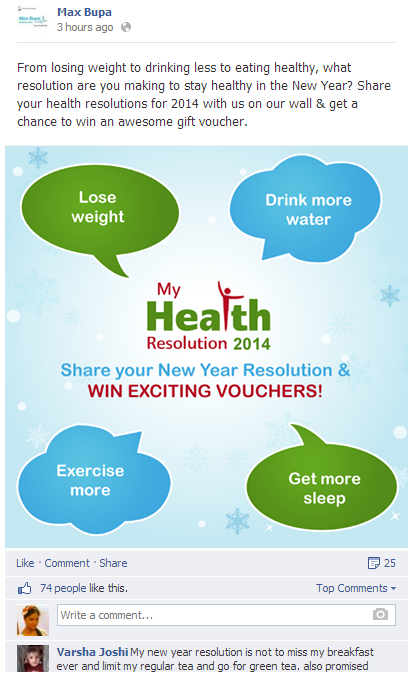 Since the new year is almost here, the brand has posted an activity on the wall where users have to share their new year’s resolutions and they stand a chance to win gift vouchers. Though this is a very old and oft repeated content strategy, atleast the brand is making an effort to be topical. Since it is receiving lots of comments on the post update, it seems to be working for the brand. One suggestion could be to run an innovative campaign around new year resolutions, smartly weaving the importance of health insurance in it. 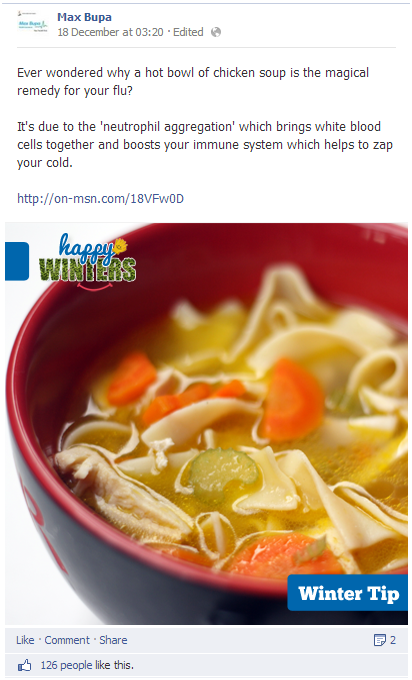 The brand is also running a campaign called Happy Winters, where it shares tips and information about how to stay healthy during winters. This, again, is a good way of staying topical, and educating users. Making use of a good cover image, the campaign was rolled out in early November. The posts are receiving less interaction as compared to posts that have an activity associated with them though. The good thing is that the brand is making use of the hash-tag #HappyWinters. Hash-tags help in search. While the brand links to the website when there is an elaborate post, it should do so more often. 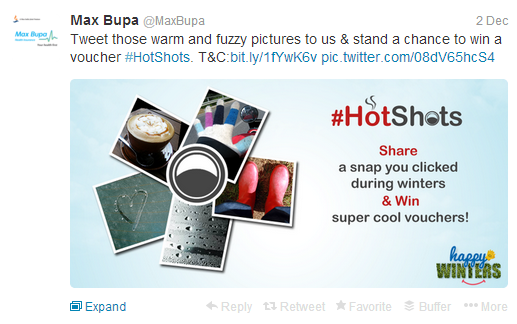 #Hotshots was a contest run by Max Bupa to add to the #HappyWinters Campaign. Users were asked to click pictures and send it across. The brand could have integrated this with Pinterest to leverage Facebook following for another platform. 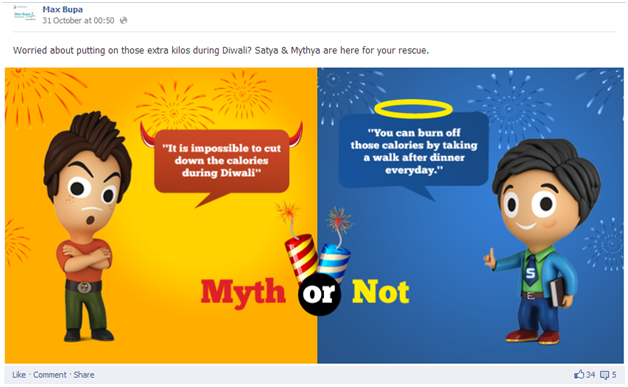 During November, Max Bupa tried to create characters called Sathya and Mythya who would give out health tips during Diwali. This was an interesting concept but, unfortunately, the brand did not continue posting updates from these characters. The entire month of October was dedicated to the Walk for Health campaign and various posts were updated. Posts motivating people to join the walk, creating competition between Delhi and Mumbai and photos of the event were posted. Photos that showcased celebrity participation witnessed a good interaction. Max Bupa is making good use of Facebook applications. 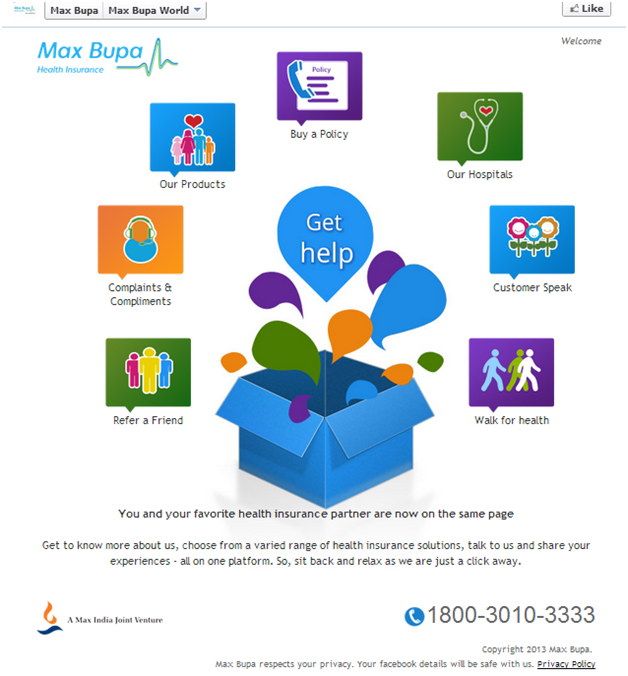 It currently hosts 3 applications on the page named, Max Bupa World, Buy a Policy and Complaints & Compliments. The landing pages for all 3 applications remain the same. This is an interesting way of presenting information. When a user clicks on any of the options, he/she is directed to the internal page on the application while the navigation becomes horizontal for ease of use. The links on top are clickable to other areas of information. One can opt to buy a policy by filling a form, view products, easily check out hospital locations and the page can also be referred to friends. A very interesting concept of customer service has been integrated through the tab. Complaints & Compliments and Customer Speak are two options for users to register queries and complaints. Unfortunately, the brand has not been promoting the application as much as it should. The average number of monthly users for the applications are between 30-50 users, which is almost negligible. Having made such an amazing application, the brand should promote it more. Max Bupa has 1619 followers on Twitter. The number is small and assuming that the brand is new on the platform, it should be more interactive. A total of 1196 tweets were made in the last 3 months while there were a total of 2495 re-tweets that had the brand handle mentioned in the tweets. Between 1st October and 20th October, the brand tweeted extensively upto 38 tweets on an average per day, followed by a drastic fall in tweeting, with about 3 tweets per day. The brand picked up once again in mid November and made 23 tweets per day for a week and then went back to 3-4 tweets a day. This inconsistency has resulted in almost a negligible increase in the number of followers and thus, in less engagement. The brand has tweeted the maximum number of times on Fridays, with a total of 313 and the least on Sundays, with a total of 80 tweets. The content creation on Twitter is hardly present as it is very similar to Facebook. The same content buckets are used on both the platforms. Infact, even the same contests are run on both the platforms. There is no differentiation in terms of hashtag or content, except that customer service is stronger on the micro-blogging site than on Facebook. In the month of October, #IWillWalkFor was created to build awareness for the activity, Walk for Health, which was heavily promoted by the brand on social media. The brand also trended the hashtag. This is also the reason why the brand witnessed maximum number of re-tweets in this time period. 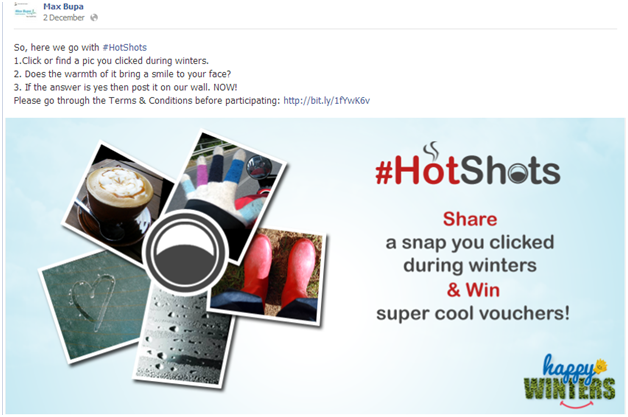 The brand received the maximum number of mentions during the month of December because of the #HotShots contest. The #HotShots Contest was being executed during this time period, where users had to tweet pictures to the brand to win prizes. Apart from the usual content buckets that are put up on Facebook, the brand did some #DidYouKnow activity on Twitter. However, this was a one-time tweet and was not continued. Neither did it receive any interaction. 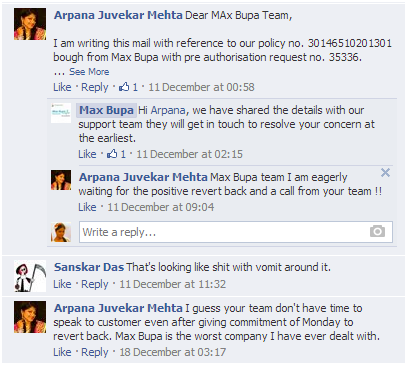 Customer Service on Facebook and Twitter As an insurance brand, Max Bupa receives quite a few complaints and queries on social media platforms. On Twitter, the brand has made an effort to respond to customers with an approach to apologize and be sympathetic. However, on several occasions it has routed the complaint to emails and not bothered to close the complaint or respond after the 1st response. Additionally, it has taken 4-5 days to get across to the 1st response. In another case, the brand has replied and routed the customer to offline support, yet not addressed or closed the complaint on Twitter. Users have commented on Facebook posts with their complaints, to which the brand has paid no heed. This clearly shows the disinterest it bears while communicating with customers online. For instance, in the post below, the brand replied after 6 hours of the complaint, which was posted during peak office hours. 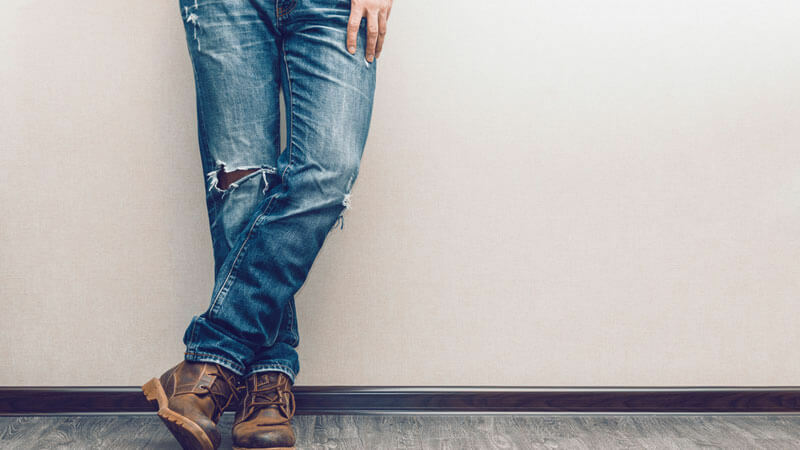 The brand had promised to resolve the concern through their offline support system, however, after 7 days, the user had again posted negatively to which the brand did not bother to respond. Clearly, there is an inconsistent and a failed approach to customer support service on social media. The brand needs to revamp its strategy completely, in order to cope with the changing mindsets of people. Max Bupa can be more efficient while dealing with customers in the social media space by regularly tracking conversations on Facebook and Twitter. The brand should understand the significance of tracking these mentions, especially because swift response is one of the growing metrics of measuring social media success today. The faster they are able to track, the faster they will be able to respond. The sooner a brand responds to the customer, the more pacified the customer will feel. 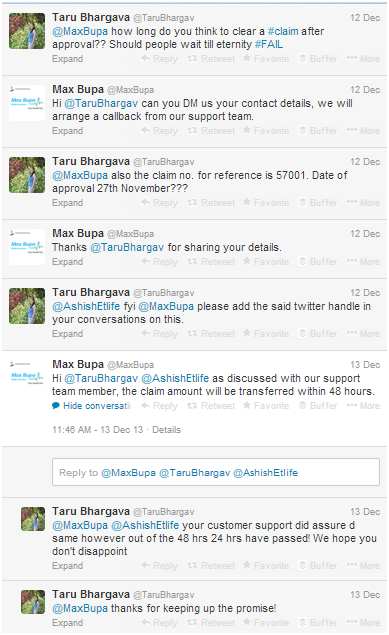 Currently, Max Bupa replies within 1 to 2 days and sometimes even after 5-6 days. This is extremely careless of a brand since the negative word has already been spread by then. Building trust by responding fast leads to a satisfied customer. The brand should use an effective tool that can not only track conversations, but also offer flawless online customer service experience, both to the customer and to the internal team. As an insurance brand, there might be limitations while responding to customers, but the brand can resolve basic queries and encourage fans and followers to use social media for customer support. If it is not possible to solve the query online, atleast have the offline customer executive take note of the problem, if mentioned, in detail by the customer. This will help the customer know that he/she can complain on social media if needed and the complaint will be recorded. However, the first step the brand should take is to build a customer support strategy on Social Media and be ready to plunge in it. Max Bupa has 27 followers on Pinterest, with a total of 9 boards and 7 pins. The brand seems to be new on the platform. The boards are empty and the platform is still in the planning stages. On Youtube, too, the subscriber base is limited to 56 users, while the total views achieved are 16K+. Walk for Health event videos are uploaded, as well as health tip videos, which are a year old are uploaded. The brand seems to be on the right track but has failed to capitalize, again due to its inconsistency. Satya and Mithya, the characters that were showcased on Facebook, have an introductory video on Youtube too. However, nothing much has been done with these characters on the platform. In terms of engagement the brand has a restless graph. Between 14th October and 20th October, it had the maximum engagement while on other days, the engagement highly varied. The brand received more shares than likes and comments, with a total of 1771. Shares are excellent for the organic growth of a page. The entire month of October, was dedicated to Walk for Health campaign and various posts were updated. 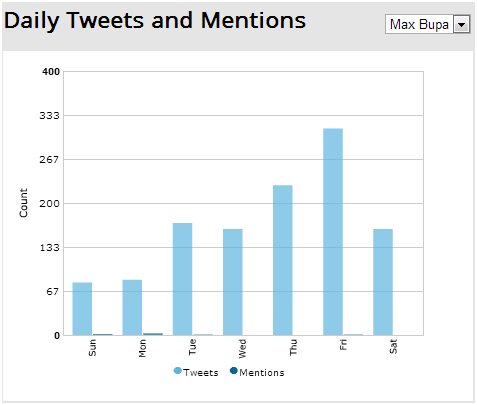 On Twitter, the brand received maximum mentions during this time. Max Bupa has 1619 followers on Twitter. There has been no increase or decrease in the number of followers in the last 3 months. Max Bupa has 27 followers on Pinterest with a total of 9 boards and 7 pins. The brand seems to be new on the platform. On Youtube too the subscriber base is limited to 56 users while the total views achieved are 16K+. Walk for Health event videos are uploaded as well as health tip videos which are a year old are uploaded. 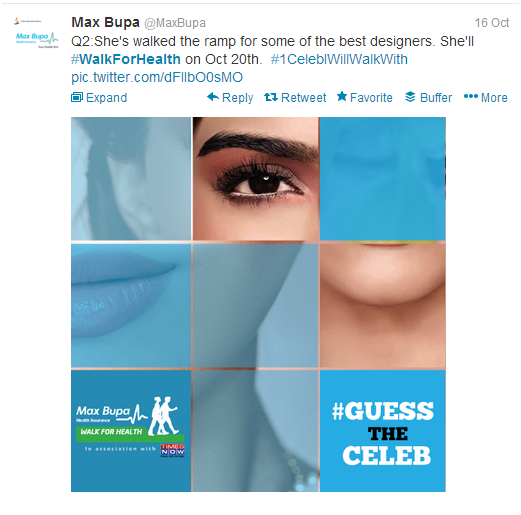 Max Bupa has achieved a decent number of followers and fans to establish a base on social media. The brand however has not maintained the growth or been consistent with its strategy. There needs to be a proper planning in place for the brand to achieve anything on social platforms. A decent share of the brand’s target audience spends time on digital and social platforms, it is thus crucial for the brand to have a sound social media strategy. It is also a brand that needs to work twice as hard to keep their audience engaged, knowing how interested the masses are in financial products. In order to keep up the engagement levels high, the brand needs to be more innovative in their content and activities. The content stream, as of now, is a little mundane and can be easily copy pasted to any other competitor brand and no one would know the difference. Their customer support on social media also needs a facelift. Criticism and complaints on social media have a huge scope of going viral, the sooner they are nipped in the bud the better. Their response time can be increased and the grievance handling process can be oiled better. Some of their contests looked a little forced, with little brand or product connect. In all, while their consistency has to be appreciated, their quality would need a little brushing up.